Excelsior Springs was founded on the healing abilities of its spring water. Opal was a young woman rumored to be the first person healed by the waters, while Chief Wapoo was rumored to be the first to discover the healing waters. Once a bustling resort town, Excelsior Springs is now a weekend destination known for its hospitality, wineries, restaurants and local shops. There are many attractions in the area, including the Elms Hotel, Watkins Mill State Park, Tryst Falls, many bed and breakfasts, and a bustling main strip in Broadway with locally-owned shops and restaurants. There are 3 wineries in the area: Fence Stile Winery, Four Horses and a Dog Winery and Van Till Winery. Willow Spring Mercantile boasts the worlds largest selection of Missouri wine, spirits and craft beers. Dubious Claims Brewing Co. serves up a great selection of cold brews and food. The annual Waterfest festival takes place the same weekend as the Opal Wapoo Gravel Grinder. 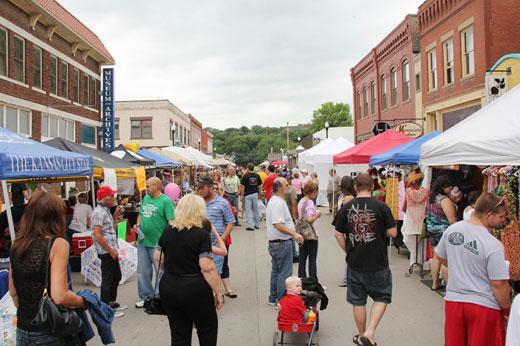 The Waterfest celebrates its 38th year in 2019 of celebrating Excelsior Springs' mineral water heritage. The race will start and finish near the Waterfest. Enjoy the fireworks of the Waterfest after you finish on Saturday evening. Friends and family can enjoy the festival while you pedal your way through the gravel roads. Looking for a place to stay in Excelsior Springs? We highly recommend Payne Jailhouse B&B (Sponsor). Payne Jailhouse has three fantastic rooms located across the street from Dubious Claims Brewery and just a few blocks form the race start. There are many other options, including the Historic Elms Hotel & Spa, Sunnyside Cottage, The Inn on Crescent Lake, and multiple Airbnb options. Looking for a campground or a RV site?